What is “Overbore”? That’s a question rifle shooters can debate to no end. This article from our archives proposes one way to identify “overbore cartridges”. We think the approach outlined here is quite useful, but we know that there are other ways to define cartridges with “overbore” properties. Whenever we run this article, it stimulates a healthy debate among our readers — and that is probably a good thing. Share the post "Defining “Overbore” Cartridges — The Great Debate"
You also have to keep everything in perspective also. Whilst the .264 Win Mag is waaaay overbore a hunter chasing speed goats seasonally with one is not likely to every wear the barrel out (hunting accuracy) in his life time. Horses for courses. It’s hard to quibble over the relative placements of each cartridge produced by the formula. But I think it’s actually a simpler concept than the ratio. The way accuracy degrades is that the lands wear down. Only the lands very near the throat do the engraving into the bullet jacket, and they wear off much more rapidly than further down. To the extend the grooves open up too, it’s also near the throat. If the bullets were press fitted slowly through barrels, lands would last multiples of times longer. Just like hammering a bullet against a steel plate only deforms the bullet, but shooting the plate deforms both the plate and bullet. So, it’s the pressure behind the bullet times the length of the bearing surface against the first part of the lands – that is really what’s wearing the steel down. How many grains of water the case holds doesn’t account for short or long bullets passing into the lands. Enter the 50 BMG, as merely a scaled up 30-06, it is a curiosity. Both cartridges operate at similar psi and their muzzle velocity is similar. The 50 weighs 4 times as much with 4 about times the actual powder charge. 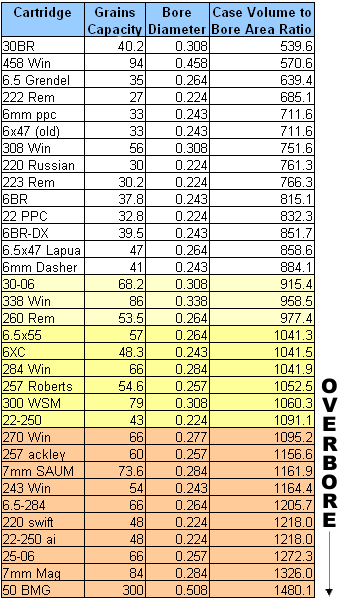 The chart shows very different barrel wear rates. From the point of view of the leading edge of the lands, the 50 is not pushing any harder than the 30.06. But the 50 is a far longer bullet so that front engraving part of each of the lands that is doing all the work, does so on a much longer jacket. Steel is equally hard in both barrels, so under the same psi, only the length of copper being displaced really differs. Something That I find interesting in this article is that no mention of pressures. For example from what i have read the .260 remington at 60k is considered to be more of a barrel burner over bore cartridge than the 6.5 swede at 51k. It makes me wonder if the formula needs to be tweeked to include pressure. I am not an expert and may be wrong.